Recently I needed to monitor the operation of an Exhaust Gas Recirculation Valve. I could have used a digital multimeter (and did in fact do this for the initial testing) but seeing what the valve was doing proved to be much easier with an analog meter. Even better, for someone who is prepared to salvage old discards, such a meter is available at zero cost. 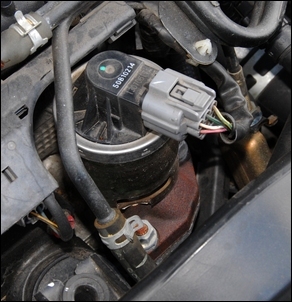 Furthermore, the meter can be easily set up to monitor not just EGR valves, but anything that’s changing in voltage. It can be used temporarily during testing or even built into a panel for permanent monitoring. Finally, it’s also easy to illuminate for night viewing. In the case of the car I was working on, the EGR system valve is electronically controlled by the ECU. It uses what is called a variable pulse width signal. That is, it is switched on and off very fast (108 times a second in this case) but the proportion of ‘on’ to ‘off’ time is varied. If it is switched on all the time, the duty cycle is said to be 100 per cent. If it is switched on for half the time, the duty cycle is 50 per cent. The lower the duty cycle, the less the valve is open. The very fast pulsing frequency of 108Hz means that in fact the valve doesn’t fully open and shut each cycle – it hovers. In fact, if you put a digital multimeter across the valve, you can see that at 50 per cent duty cycle, the meter is seeing about half battery voltage. At 25 per cent duty cycle, the meter reads about one-quarter battery voltage. Because the valve is being pulsed so quickly, the meter reads the average voltage that the valve is seeing. During on-road testing I was using a good quality multimeter to directly read duty cycle and voltage. However, once I got a feel for the readings, on the road this measuring system was rather awkward. The meter couldn’t be placed in my line of sight, so I had to keep looking down at the passenger seat or centre console. The digital numbers also had to be actually read, a process that again took my eyes away from the road for longer than desirable. However, by using a much more compact analog meter, the readout could be placed on the dash and the opening of the EGR valve seen at the merest glance. That was especially useful when in most of the testing, just a rough idea of the EGR valve opening was needed – ie, was the valve fully open, half open, a quarter open or closed? As you’ll see in a moment, these meters can also be used to monitor other voltages, like battery voltage. For example, if you have a big sound system, the meter can be built into a panel near the amplifier, so monitoring the voltage actually reaching it (and therefore taking into account real-time voltage drop in the cables). However, it’s important that you realise that these meters have low input impedance, that is, they will load down circuits that don’t have the capacity to supply a reasonable amount of current. This means they’re OK with battery voltage, or monitoring voltages running solenoids, but you could not use these meters to monitor oxygen sensor voltage (instead, if you want an analog meter to do this, see AutoSpeed Needle Mixture Meter - Part 1). OK so what are these meters we keep talking about? They’re available at zero cost if you pick up an old discarded cassette deck that has analog VU meters. In addition, you’ll need a 100 kilo-ohm multi-turn trimpot, used as a variable resistor to calibrate the meter for its new use. 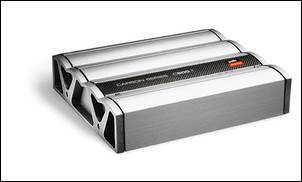 These can be salvaged from old equipment, or bought new – eg Jaycar Electronics RT-4620 at $1.50. Old cassette decks with large illuminated VU meters turn up all the time in garage sales, at the tip, and at hard rubbish kerbside collections. It is extremely rare for the VU meters to be dead, so you can be fairly safe in collecting any old cassette deck for this purpose. About the only thing to look out for is that it’s preferable to use a deck that has two separate meters, rather than one that has them built into a single display. VU meters are moving coil voltmeters that have a very high sensitivity. 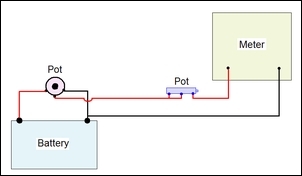 This means that it takes little voltage to move the needle across the full scale – typically, just 0.3 – 0.4V. If you need to measure a voltage that rises only to about 0.4V, all you need do is connect the meter straight across the supply. 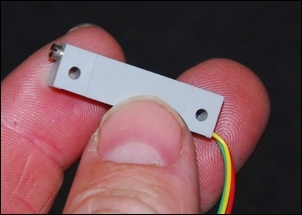 However, it’s much more likely that you’ll want to measure a peak voltage of 5 or 12V. However, it’s very easy to decrease the sensitivity of the meter – just wire a variable resistor in series with the meter, as shown here. 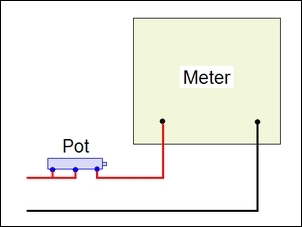 At its simplest, that’s all you need to do – just wire the meter to the pot, and then wire the circuit to whatever you want to measure. The circuit you’re measuring provides the power to run the meter, so it’s very simple to make it all happen. Just adjust the pot until the highest signal that you are measuring moves the needle across to full scale. But what if you want to calibrate the system? That’s easy too. Most VU meters use a non-linear movement – that is, the needle moves less for a given voltage input at the top end of the scale. So as you go around the scale, you can either make your markings closer together, or keep the increments spaced the same distance apart and jump further between numbers. We chose to do the latter. You can use your PC and printer to make the new scale. While at first it seems as if it would make most sense to scan in the original scale and modify it, in practice it’s best to start with the scale from another instrument. The meters shown here use a scale that was originally scanned from an old speedo. Once you have the arc and the increments, you can use the software to delete the numbers and other markings you don’t want. Measure the width of the scale on the meter and then size the scale to match this, at this stage printing it out without any numbers on it. Carefully remove the original scale (most meters are held together with just sticky tape with the scale glued into place) and then temporarily place your un-numbered scale behind the pointer. 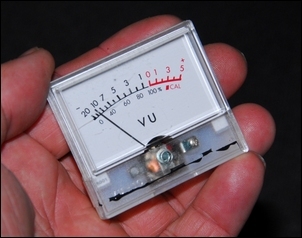 Use a multimeter to measure the actual voltage being fed to the VU meter. So how do you perform the calibration? Firstly, adjust the meter’s pot so that the most commonly read maximum voltage is towards the end of the meter’s scale. After you’ve set this, don’t touch this pot again. Next, alter the input voltage, measure it with the multimeter, and work out what each of the other graduations on the modified VU meter scale show. Round off the voltages to the nearest whole volt. 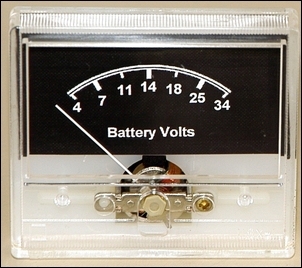 For example, on one of the meters shown here, the scale goes: 4, 7, 11, 14, 18, 25, 34 volts. When the scale markings are worked out, use the image manipulation software to put the correct numbers on the scale, along with any other writing you want. Then print it out on gloss paper, cut it to shape and stick it in place. You can of course put whatever markings you want on your scale. For example, if you are monitoring the car battery, the markings could be simply ‘normal’ ‘high’ and ‘low’. If the meter needs to be used at night, it’s easy to illuminate the scale – the cassette deck probably had a suitable bulb in it, although check it matches 12V. Otherwise, use a LED (with dropping resistor) or any small 12V light bulb. Next time you see a dumped cassette deck with mechanical VU meters, grab it! Storing the salvaged meters take up little space and they can be very useful, either as permanent instruments or for short-term testing.